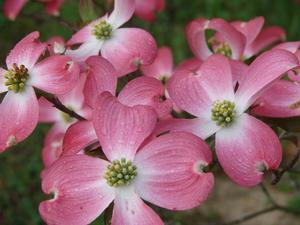 Blooms in April and May, with pink bracts that resemble petals radiating cross-like. Features dark green leaves that are oval or egg-shaped, that turn reddish-purple in the fall. Choose a sunny to partially shaded area. Prefers moist, organically rich, acidic soils. Benefits from a 2-4" mulch, which will help keep roots cool and moist during the summer.